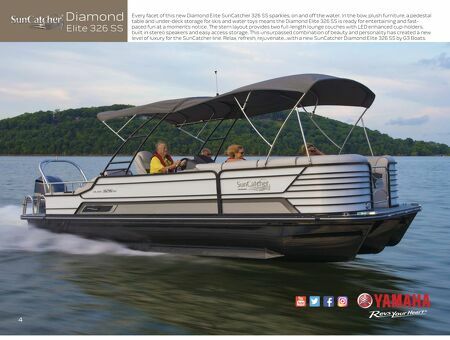 Abundant storage is available on the Diamond Elite 326 SS. Convenient charging station is within reach of the Captain's helm chair. Re Captain's high-back helm chair swivels and reclines to allow perfect adjustment for complete comfort. 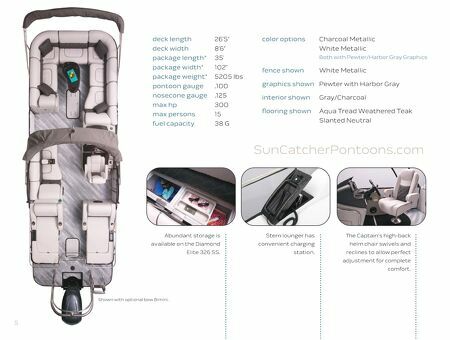 5 deck length 26'5" deck width 8'6" package length* 35' package width* 102" package weight* 5205 lbs pontoon gauge .100 nosecone gauge .125 max hp 300 max persons 15 fuel capacity 38 G SunCatcherPontoons.com color options Charcoal Metallic White Metallic Both with Pewter/Harbor Gray Graphics fence shown White Metallic graphics shown Pewter with Harbor Gray interior shown Gray/Charcoal flooring shown Aqua Tread Weathered Teak Slanted Neutral Shown with optional bow Bimini.